Are you ready for a wild ride around the world without ever leaving your home? Here is your ticket to all the fun and adventure you can handle, and more besides. 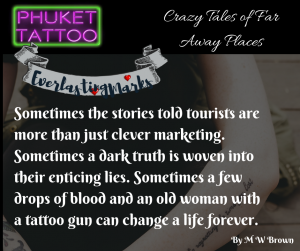 Exotic locations and thrilling action combine in PHUKET TATTOO: Crazy Tales of Far Away Places. People smugglers in Vietnam, sinister plastic surgery resorts, drinking in Serbia with Uncle Vlado, and many more stories of travel, mayhem, and broken bedframes. Features 20 stories from authors all around the world. Art Inspires Words – Out Today!